Benco Dental, the nation’s largest privately-owned dental distributor, with an 88-year record of delivering success to dental practices, introduces Herman Miller Compass cabinetry. The sophisticated furnishings of Herman Miller and Nemschoff have been used in stylish, versus sterilizing, healthcare environments for five decades, elevating the human experience of care. As a Herman Miller Healthcare dealer, Benco Dental offers oral health professionals an elevated new world in which to work. 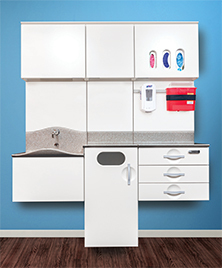 Compass cabinetry for the dental operatory presents a system designed for change. Components are easily assembled, removed, rearranged and refreshed. Storage can be quickly relocated, dental utilities can be easily accessed, added or modified, and damaged product can be easily replaced without demolition. Tiles and components are wrapped in durable material that requires no edge banding. The results: unmatched flexibility with a seamless, cleanable, durable surface. Intelligent design and efficient installation make the purchase price affordable. For more information, visit: benco.com.